Ribbons of light have been photographed for decades and everyone assumed they were auroras. Now scientists believe they are not auroras. Read on to learn more about these ribbons of light. Have you ever seen an aurora? The most famous of auroras, the Northern Lights, has performed an inspiring show above Earth for thousands of years. If you have seen the Northern Lights, you would agree that the event is quite mesmerizing. For decades photographers have captured ribbons of light in the night sky. Everyone assumed that the ribbons were auroras. However, in 2016, scientists decided to look a little closer at the lights. What did they discover? That these ribbons were not auroras. Why did scientists determine that the ribbons of light were not auroras? Simply, they lacked a common property associated with the Northern Lights. The Northern Lights appear as electrons and protons pour into the ionosphere. As a result. These electrons and protons collide with gas particles which include hydrogen and helium. Consequently, the collisions emit light and often produce beautiful colors of green, pink, and purple. 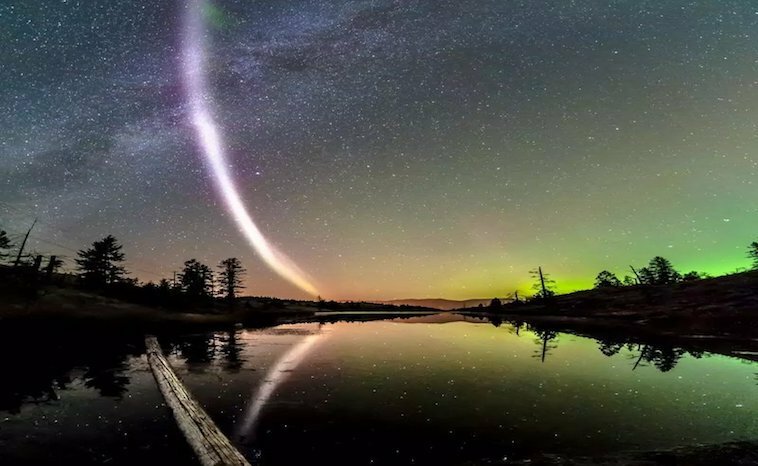 With the acronym STEVE, Strong Thermal Emission Velocity Enhancement, scientists now begin the process of scientific hypothesis and study. Why did they pick the name STEVE? Strangely enough, it comes from the 2006 movie Over the Hedge. The characters in the movie gave the name to a hedge to make it appear less scary. Last year, a Facebook group posted photos of “ribbon auroras”. Physicist Eric Donovan from the University of Calgary in Canada saw the pictures. However, he saw something different and decided to look further into the phenomena. Donovan looked to SWARM to gather his data. SWARM is the European Space Agency’s mission to study Earth’s geomagnetic field. It has three satellites placed in two different polar orbits. Presently, two fly side by side at an altitude of 450 km (280 mi) and a third at an altitude of 530 km (330 mi). These satellites carry navigation and electromagnetic tools. He gathered the combination of times and location of Steve and put them together with the phenomenon’s unusual characteristics. “As the satellite flew straight though Steve, data from the electric field instrument showed very clear changes,” Donovan said. Donovan went on to say that his team does have an idea as to what might be causing a spike in temperature, but will not disclose it at this time. “It turns out that Steve is actually remarkably common, but we hadn’t noticed it before. It’s thanks to ground-based observations, satellites, today’s explosion of access to data and an army of citizen scientists joining forces to document it,” says Donovan. Other photon auroras do exist as cited by the Imager (Magnetopause-to-Aurora Global Exploration) satellite. The proton auroras are caused by small ‘substorms’ in the magnetic field (magnetosphere) that surrounds the Earth. Substorms, which last for about an hour, are generated when the Earth’s magnetosphere gets charged up with protons and electrons and then discharges. These storms are different from the electron aurora found with the Northern Lights. What we do know is that light phenomena fill our night skies, giving us pause from our daily lives to reflect on the awe-inspiring images from space.